Photo: Bathing area at Sing Sing. 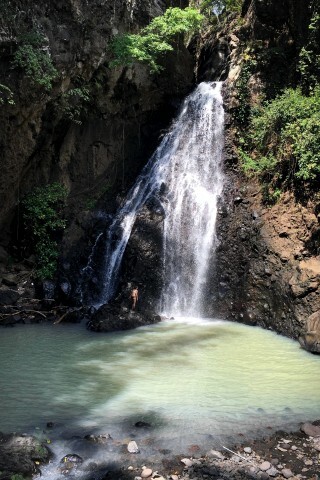 Great for a refreshing dip on a hot day, Sing Sing is a small but pretty waterfall close to Lovina. Following the Singaraja-Serirt road four kilometres west of Lovina, a signposted turnoff to Jalan Singsing continues for another kilometre to the village of Temukus. The short 10-minute trail through the low forested hill begins at the Bale Banjar (the village’s community building). We were warned by locals that it wasn’t worth visiting as during the dry season, as there’s no water. However, although not very high or large compared to other local waterfalls, we found more than a mere trickle and a very pleasant and secluded spot for a bit of respite from the heat. We would imagine it to be more spectacular during the wet season. Beneath the falls, the large lagoon is not sparkling clear, but has a greenish sulphur-like appearance, similar to the water colour at nearby Banjar hot springs. It appears clean. Local guides near the beginning of the trail offer their services for 50,000 rupiah. We ventured alone, and the path was easy to follow, however we missed the trail continuing uphill to another larger falls and bigger swimming hole, supposedly with a mud bath, so if you wish to explore a bit more a guide may be worthwhile. For history buffs, Jalan Singsing continues uphill to Tugu Belanda (the Dutch monument), built by Dutch colonialists to commemorate the deaths of its soldiers in the Banjar war in 1868. As a show of Indonesian nationalism, in the 1950s the 15 metre white monument was destroyed, but later rebuilt in 1992, perhaps with equal nationalistic pride, preserving it as a historical reminder of those who defeated the Dutch Army.